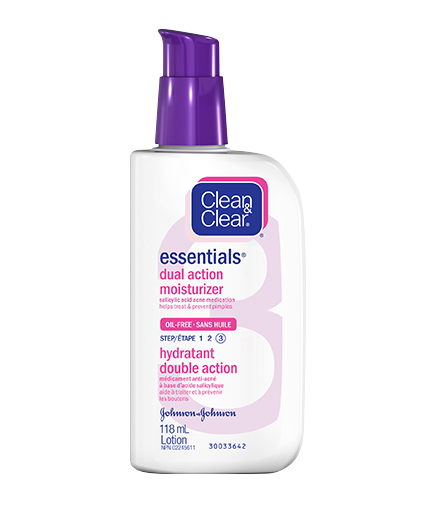 CLEAN & CLEAR ESSENTIALS® Dual Action Moisturizer combines oil-free moisture with a proven acne-fighting ingredient. It can help to moisturize dry skin while treating and helping to prevent breakouts. It leaves your skin feeling soft and smooth. After you've cleaned your face, you're ready for the finishing touch. This dual action moisturizer also contains acne-fighting medicine. Apply a thin layer over the affected area. Do this once a day for the first few days, then gradually increase to 2-3 times a day if needed or recommended by your doctor. If your skin starts to dry out or peel, reduce your use to once a day, or every other day. Non-medicinal Ingredients: Aluminum Starch Octenylsuccinate, BHT, Cetearyl Alcohol, Ceteth-10 Phosphate, Dicapryly Ether, Dicetyl Phosphate, Dimethicone, Disodium EDTA, Glycerin, Lecithin, Magnesium Aluminum Silicate, Menthy Lactate, Methyl Gluceth-20, Neopentyl Glycol Diethylhexanoate, Neopentyl Glycol Diisostearate, Parfum, Sodium Hydroxide, Steareth-2, Steareth-20, Water (eau), Xanthan Gum. For external use only. Avoid contact with eyes. If contact occurs, rinse with water. Using other topical acne products at the same time or immediately after this product may increase skin dryness/irritation. If this occurs, only one product should be used unless directed by a doctor. Discontinue use if excessive skin irritation develops or increases. This is a great moisturizer for teens to adults.I have been using it for over 20 years and always go back. Light and doesn't clog my pores. Absorbs instantly and not greasy feeling at all. Nice light fragrance. Great mositurizer that helped relieve my acne and moisturizes my skin at the same time. Does not dry out your skin leaves it feeling soft. Great Daily Moisturizer if you have Acne!! A couple times a week I have severe acne and I use this Clean & Clear moisturizer several times a day and it helps with the itchiness, soreness and redness. I recommend this to anyone who has acne. I am close to 50 and recommend this moisturizer for all adults and even teens. Great product, thanks Clean & Clear. I find that this is a pretty good moisturizer for the price. It does it's job. Works great to keep my skin hydrated while at the same time keeps acne from breaking out.